I just created this little drawing. Tell me how you feel about it. Sexually abused and running away. Interesting his hand placement as if he does not want to hear or know. I wonder what the shadow specifically represents. A memory...a person... Thanks @yoganarchista nicely done. Thank you very much for your comment. I am sorry it took me so long to answer. 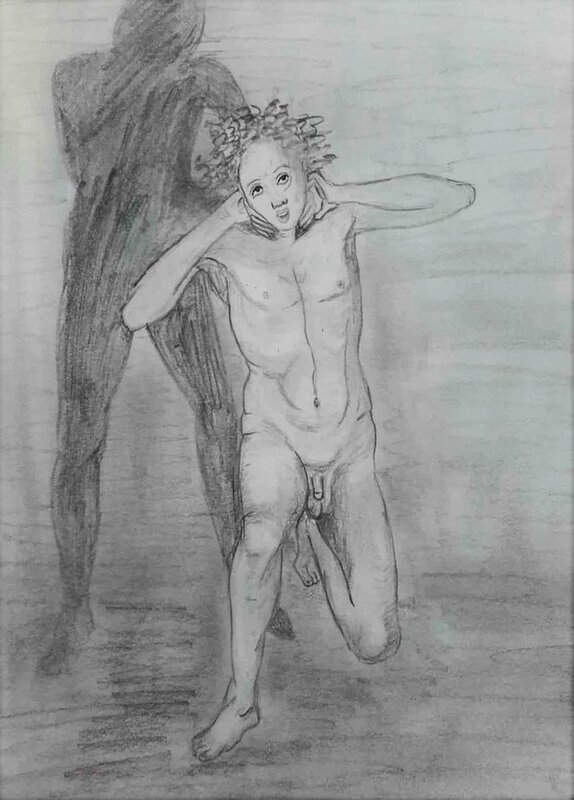 The inspiration for this drawing came from a Renaissance painting, that I scetched and transformed. In the original the figure is pushed down on the ground by a dewil like figure. I wanted to transform the drawing to a shadow that is present in memories of friends of mine. The memory of abuse terrifies and makes people run from something that is not present but a very strong influence in present behaviour. Sometimes this can lead to wrong judgement. I feel compassion with the person trapped in the terror but I also want to show that shadows of the past can not really hurt you anymore and that you start strangulating yourself by fighting a memory. It's like Peter Pan's shadow is out on a killing spree. I love it. Because They Are very nice. @yoganarchista, That would be perfect perfect art design my friend. I'm pretty stunning to see your art skills. You're perfect artist for drawing field. Just excellent. Looking like slender man kidnapping a naked grown up child.